Maple is the Steiff Club Teddy Bear new in 2016. 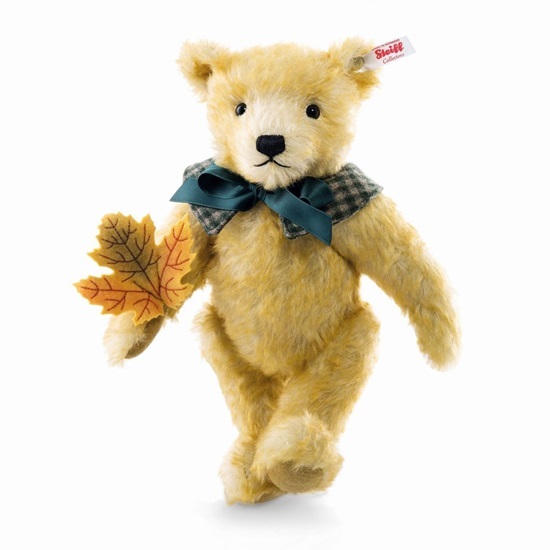 Created specifically for Steiff Club members, we are proud to share "Maple", a 11 inch yellow tipped mohair bear. She is 5 way jointed, has black safety eyes, and is surface washable. Maple is sewn from a unique blond mohair that has been lightly tipped for extra depth and added dimension. Her paw pads are brass colored wool felt. Her nose and mouth are hand-stitched. Around her neck, Maple wears a woollen collar with a checked pattern, finished with a green satin bow. A highly detailed maple leaf is attached to her right paw. The leaf has been lovingly airbrushed and its veins are intricately stitched on both sides for added realism.